A new study, “Shrinking portions to low and middle-income earners: Inequality in Wages and Self-Employment 1998-2015” shows rising inequality in the hourly rates of gross earnings (before tax and benefits) among both wage and salary earners and the self-employed over the period 1998-2015, although incomes of the lowest 10 percent (decile) of wage and salary earners benefited greatly from strong rises in the minimum wage since 2000. A majority of people received either low incomes per hour or experienced low growth in those hourly rates, or both. The data was provided on special request by Statistics New Zealand (SNZ) from the New Zealand Income Survey and comprises jobs sorted into deciles by income per hour, along with hours worked, numbers of people and total income earned in each decile. It covers all jobs held by a person and is before tax and benefits such as Working for Families tax credits. Data for 2016 was unable to be used because a change in the survey prevents valid comparison between 2016 and earlier data. For wage and salary earners (employees) the study finds increasing inequality in average hourly wages. The exception is the lowest income decile which is heavily influenced by the minimum wage, whose income has risen on average at about the same rate as the top decile and rose faster during the Labour-led Government in the early 2000s than in previous or subsequent National-led Governments. Other than that, wage rates for the next 50 percent (deciles 2 to 6) of employees rose much more slowly than the wage rates of higher income wage and salary earners: the real average hourly wage of the top 10 percent rose by 39 percent while the low and middle income 50 percent rose by 18-20 percent between 1998 and 2015 in real terms. On the whole, the more highly paid employees were, the faster their hourly wage rates increased, creating growing inequality. There is a ‘hollowing out’ of the wage scale in the sense that the low and middle income half of employees were getting much lower real increases in pay rates than the top 40 percent – and that higher income group is becoming increasingly unequal. On the other hand weekly wages showed a weaker growth in inequality over the period. The reason is that employees on lower wages worked increasingly long hours to make up for slower increases in their hourly rate, while those on the highest 40 percent of wages reduced the hours they worked. The top of the lowest income decile closely tracks the adult hourly minimum wage but the average for the decile averaged 10 percent below the minimum wage implying many workers are being paid below the adult minimum wage. Some of this can be explained by factors such as lower minimum wage rates for young workers and trainees, misreporting of incomes, and the unintended inclusion of some self-employed who pay themselves a wage or salary in SNZ’s survey, but there remains a gap that could suggest significant flouting of minimum wage laws. In 2015, an estimated 778,000 or 39 percent of wage and salary earners earned below the Living Wage. Two-thirds of wage and salary earners had wages below the average hourly wage over the period. To a reasonable approximation, employees paid below the overall average hourly wage received either low wages or experienced low wage growth, or both. The main differences between the policy regimes of the Labour-led Government (taken to be 2000-2008) and National-led Government (2009-2015) were a slower rate of real wage growth and faster rise in hours worked under National. 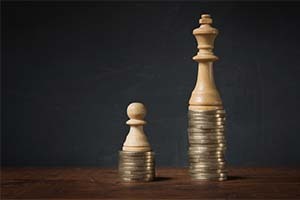 Wage inequality rose under both Governments though there is a suggestion of a pause towards the end of the Labour-led Government. Self-employed people earned less than wage and salary earners per hour comparing both average and median hourly incomes for the whole of each group. Their incomes also increased more slowly. However their ability to spread their incomes among family members and to take income as capital gain (not reported in Statistics New Zealand’s survey) are also important factors. The spread and inequality of earning rates is far greater for self-employed people than employees: the lowest income 10 percent had negative incomes and in 2015, an estimated 41 percent of self-employed were earning less per hour than the minimum wage and 51 percent were earning under the Living Wage. Meanwhile the highest 10 percent had average hourly earning rates double those of the highest 10 percent of employees on average over the 1998-2015 period. Among self-employed, the higher their earning rates (whether hourly or weekly) the more rapidly they rose over the period. The bottom 30 percent however had falling earning rates in real terms. Their weekly incomes were not moderated as much as employees by the hours they worked, and it is the highest earning self-employed who work the shortest hours (averaging 29 hours per week in 2015). Average hours worked have fallen or remained static for almost all self-employed income groups over the period of study and although on average they still work longer hours than employees, that difference has fallen to 39.3 hours per week for self-employed compared to 36.3 for employees in 2015. The main differences between the two policy regimes with respect to self-employed incomes were a rise in income inequality under Labour compared to a fall under National (though inequality was by then at a higher level). There is a suggestion of a slower rate of income growth and slower fall in hours worked under National but this difference is unlikely to be statistically significant. The strong rises of the minimum wage over the period have been effective in protecting the wage rates of the lowest income 10 percent of employees, but not those of the next 50 percent or more in deciles 2 to 6. It is surprising that the minimum wage does not support a greater ripple effect up the wage scale. Such hollowing out of the wage distribution is often explained by technology making middle skill jobs redundant and forcing more people into low skilled, low paid employment. However the evidence for this is mixed in New Zealand. There is a rising proportion of jobs in higher skilled occupations, but there is also evidence of the average skill of workers falling in recent years because of strong growth in the employment of lower skilled workers. The poor wage increases beyond the bottom decile could be because of the weak bargaining power of the majority of workers who do not have coverage of a collective employment agreement. Globalisation is increasingly recognised as another contributor to wage inequality which has some explanatory power for New Zealand. The impact of the minimum wage shows that such effects can be significantly and positively countered by regulatory measures. The data provides little support for the idea that people have low incomes because they don’t work hard enough. The highest income earners among employees worked fewer hours per week on average than the next five deciles and their work hours fell over the period. The highest income earners among self-employed people worked the fewest hours on average of all self-employed deciles, and more only than the lowest employee decile whose members on average worked part time. Because of the ability of the self-employed to disguise or under-report their income in various ways, further research is needed to understand to what extent the low earning rates they report, and the low rate of increase in earnings, is a reality. Tax authorities and policy makers should be interested too. However, among the self-employed are some with very low incomes, and many of them are likely to have very variable incomes too. Public policy should take an interest in those who are forced into self-employment (often dependent contracting) by their employers, or where small businesses are given special advantages. The low rates of earning also suggest that very poor labour productivity is widespread among the self-employed, a further concern given it constitutes a sizeable portion of New Zealand’s economy. * Dr Bill Rosenberg is the Policy Director and Economist for the New Zealand Council of Trade Unions. Doesn't the same phenomena occur the world over? Maybe but we ought to be worried about this trend - inequality causes distrust in society and leads to misery and crime. There was terrible inequality in Victorian times but the rich and poor lived within sight of one another and there was very visible social mobility. Not in NZ now with the wealthy clustering around high decile schools and use of the car as the principal mode of transport means the different strata of our society barely interact other than the shopping mall and a very few sporting events. Are the self employed under-reporting their incomes? Will the 100,000 immigrants working towards permanent residency also be exaggerating their income - if so that is a phenomena of recent years since we began promising the dream of citizenship to every foreign student. This is exactly the stuff that worries me, and why I can't join in the self-congratulatory celebrations often going on here, where we pretend there are no negative effects coming out of NZ's housing crisis and other issues. Society is not static, and it won't stay a great society unless we work at it. An admirable position to take. As always Rick your comments reveal a more evolved human being than the spruiker simpleton class ! You need an hour - and don't let the slow start worry you - it's packed full of excellent statistics and it takes her a bit of time to wind that up. But this is so instructive in terms of where we are going here too. Ideas so powerful that they lost the election to .... Enough said. It's not a lecture full of ideas, but a lecture full of statistics/facts. Sorry Kate, I'm afraid according to some on this site "progressives" only deal in hyperbole, cliches and rhetoric. Let's not let facts or experts get in the way of a good right wing opinion. Isaac Asimov springs to mind at this point, in particular his closing words on anti-intellectualism ".....my ignorance is as good as your knowledge." Especially the input of Republican strategist Frank Luntz. Worth a watch to the end. A good many of those who voted for Trump were middle class and had seen their incomes stagnate over a long period of time. A very good account of how this has happened is Robert Reich's "Saving Capitalism-For the many,Not the Few". The chapter on The Declining Power of the Middle lays it out very clearly and powerfully. Frankly,I am not optimistic that this can be reversed. Yep, he's really no better than his predecessor when it comes to deceit. What deciles do 48,000 & 70,000 sit in respectively? I have a feeling that those 2 deciles are affected more by tax brackets than anything else. I reckon that if you raise the 17.5% tax bracket to 52,000 you will see a close to 8% rise in the income of people in that bracket within a couple of years. I saw the tax return breakdown a while back, I have to say I was amazed at how many kiwis earn just under the higher tax threshold, it was an eye-opening coincidence. The chart read as you'd expect it to, low income standard, mid-level earnings being the majority, high earnings less and then a rather strange anomaly - an enormous spike just before the highest tax rate kicked in. I love paying other people's taxes me. That is odd, there should have been 2 very distinct spikes. One at 48,000 and the other at 70,000. Those people in that spike tend to have 0% wage growth every year. They are probably dragging the % wage growth for their decile down by a lot! How unfortunate would it be to never have any hope of any wage growth, except when tax thresholds move. Maybe the govt could give tax benefits to anyone stuck on 0% wage increase for 5 or more years? Either that or people are positioning their earnings at the threshold margins, and apologies re: the spikes, you're right, there was a spike at the lower threshold as well, it's been a while since I saw the chart so was going from memory. Call me a cynic but those spikes suggest to me that people are fiddling their taxes to come in just short of the tax bands. I'm not averse to bracket creeps at all and I suppose it would be interesting to see if there would be increases should those brackets move. I'd rather people just paid up the taxes that are due though instead of fiddling them, so they can save themselves a few bucks a week. I'd also like to see a higher wage tax come in maybe somewhere between $150k & $200k, even though that would affect me. Maybe they do, but in the context of this article having those spikes stay in the same place without moving is hollowing out the middle. What are the odds that if we indexed the bands to inflation the people with incomes in those spikes also suddenly find their income indexed to inflation? It would cause a couple of the middle deciles to show wage growth! I would agree with a new 35% tax threshold if it kicked in over about 500,000 and the 30% threshold was moved out to about 250,000. Perhaps with a new 20% threshold at 100,000 as well. I believe that you'll find that creating more thresholds at the top just makes the 2 spikes we saw grow. Folk do have capacity to position the salary and thus tax bracket they sit on. Happens all the time. But it's not all some dodgy fiddle. A small company owner might decide to pay themselves via a salary and thus pay tax via PAYE. They will pick a figure that is convenient for their need (groceries). However if they set the salary low, then the company makes more apparent profit and pays more tax. You end up paying the tax one way or the other. It was the only income distribution I could find - 1999 to 2011 so missing some years but would be surprised if it's that different. Maybe someone can find something more recent to compare to. Great to see an article of this nature with some depth. Certainly with the self employed the trends here are what I have seen owning a CA firm for 25 years. Of course the 700% pa. increase in low-skilled immigrants has absolutely nothing to do with falling wage growth, people being forced to work longer hours, and for less than the minimum wage! One only needs to look across the Tasman at the Dominos and 7/11 employment practices to see how this works. Public servants average weekly earnings is $1451.00 per week. Average hourly rate in the public sector is $38.81 rises to $1473.00 with overtime. Average hourly rate in the private sector is $27.82 rises to $ 1085.00 with overtime. Private Sector wages have been hollowed out.